Dazzle of Fog at Film City Glasgow on 29th September 2012. Dazzle of Fog is a unique experimental audio/visual event that platforms ambisonic immersive sound technology with innovative performances, film and installations from seven of Glasgow's cutting edge producers, artists and film makers. The event will consist of four specially commissioned pieces that will allow the artist to portray their interpretation of a cinematic experience. ‘Suilven’ is a collaboration between classical composer Giles Lamb under his production moniker Lafoden and Glasgow based filmmakers James Anderson and Niall Walker. The title belongs to a mountain located in the far North West of Scotland in an area called Assynt. The mountain’s unique topography manifests as a dramatic monolithic entity amongst a challenging remote wilderness. 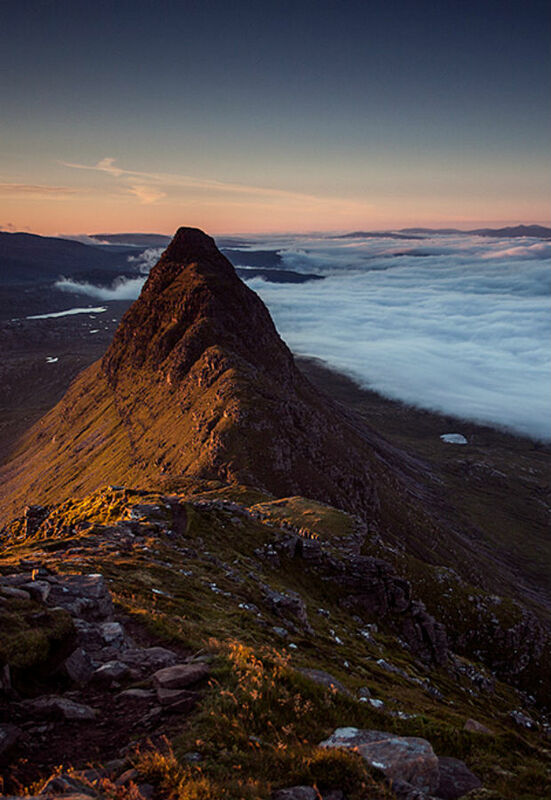 Scottish Poet Norman MacCaig was moved to pen ‘Climbing Suilven’ in its honour. James and Niall have been inspired to document a day in the life of the mountain on film and capture its foreboding natural beauty and power. To complement the film, Giles Lamb will manipulate the organic essence of the land through field recordings to construct an emotive contemporary classical score. Giles will present a live interpretation on piano with string ensemble at the event with the raw audio of the mountain existing in a spatial ambisonic set up. The next collaboration involves electronic music producer Alex Smoke working with visual installation artist Florence To. Alex Smoke is on the cusp of releasing his forth album, this time under the pseudonym Wraetlik on London based Convex Industries. Alex’s sound has evolved over the years and he has continually sought out innovative projects to work on, including his classical commission with Scottish Ensemble and his electronic/classical score of FW Murnau’s silent epic ‘Faust’. This collaboration with Florence To will explore the dark and abstract depths of audio/visual manipulation as a live performance. Florence is an emerging artist in the field of visual installation. Her work focuses on creating portable installations to work with diverse space, taking it’s characteristic features as a starting point and modeling patterns, shapes and structures which will repositioned within it. This will involve experiments with light, materials and textures as well as mapping objects to create a new identity and atmosphere, which will interact with the senses and perceptions of the audience. Tom Scholefield is one of Glasgow’s premier digital artists with an impressive body of work that includes video animation, design and music production. Under his Konx-Om-Pax alias he has just released his new album 'Regional Surrealism' on the cutting edge imprint Planet Mu. For Dazzle Of Fog, Tom will be creating a film that utilises the ambisonic technology to disorientate the audience. His source of inspiration is the work of Italian Futurist Luigi Russolo and his 1913 manifesto “The Art Of Noises”. As one of the world’s first ‘Noise’ artists he created machines called ‘Intonarmori’ which acted like mechanical noise generators on which he performed ‘noise’ compositions. Tom says “My idea is to create virtual noise machines using 3d animation software and to composite them onto live footage of various locations around Glasgow. I would also be making field records of the locations and processing the sound for them to be "played" by the noise generators on screen. I will choose several different locations which have distinctive sounds in their environment. Rob is internationally renowned Glasgow based artist who fuses sculpture, film and live video manipulation to create dynamic installations. Rob's piece will conjure disorientation, bewilderment and a gamut of emotional responses through ambisonic audio manipulation. As he describes his inspiration for the piece. The acoustic design and ambisonic implementation for the event is contributed by Nick Fells, Head Of Music at Glasgow University. Tickets £10 + booking fee.